There is a growing recognition around the world of the need to come to terms with Strauss’s thought. Important books on his thought have been published in recent years. Paweł Armada and Arkadiusz Górnisiewicz, eds., Modernity and What Has Been Lost: Considerations on the Legacy of Leo Strauss (Kraków: Jagiellonian University Press, 2010). Leora Batnitzky, Leo Strauss and Emmanuel Levinas: Philosophy and the Politics of Revelation (New York: Cambridge University Press, 2006). Jeffrey Alan Bernstein, Leo Strauss on the Borders of Judaism, Philosophy, and History (Albany: SUNY Press, 2015). Timothy W. Burns, ed., Brill's Companion to Leo Strauss' Writings on Classical Political Thought (Leiden: Brill, 2014). Tony Burns and James Connelly, eds., The Legacy of Leo Strauss. (Charlottesville: Imprint Academic, 2010). Paul Gottfried, Leo Strauss and the Conservative Movement in America: A Critical Appraisal (Cambridge: Cambridge University Press, 2012). Kenneth Hart Green, Leo Strauss and the Rediscovery of Maimonides (Chicago: University of Chicago Press, 2013). Grant N. Havers, Leo Strauss and Anglo-American Democracy: A Conservative Critique (DeKalb, IL: IIU Press, 2013). Robert Howse, Leo Strauss: Man of Peace (Cambridge: Cambridge University Press, 2014). Harry Jaffa, Crisis of the Strauss Divided: Essays on Leo Strauss and Straussianism, East and West (Lanham, MD: Rowman & Littlefield, 2012). David Janssens, Between Athens and Jerusalem: Philosophy, Prophecy and Politics in Leo Strauss’s Early Thought (Albany, NY: State University of New York Press, 2008); Tussen Athene en Jeruzalem: Filosofie, profetie en politiek bij Leo Strauss translated into English by David Janssens. Chen Jiang Hong, Between Politics and Philosophy: A Study of Leo Strauss in Dialogue with Carl Schmitt (Saarbrucken: VDM Verlag Dr. Muller, 2008). Victoria Kahn. The Future of an Illusion: Political Theology and Early Modern Texts (Chicago: University of Chicago Press, 2014). Liisi Keedus, The Crisis of German Historicism: The Early Political Thought of Hannah Arendt and Leo Strauss (Cambridge: Cambridge University Press, 2015). Laurence Lampert, The Enduring Importance of Leo Strauss (Chicago: University of Chicago Press, 2013). Antonio Lastra and Joseph Monserrat-Molas, eds., Leo Strauss, Philosopher: European Vistas (Albany, NY: SUNY Press, 2016). Rafael Major, ed., Leo Strauss's Defense of the Philosophic Life: Reading "What is Political Philosophy?" (Chicago: University of Chicago Press, 2013). Heinrich Meier, Carl Schmitt and Leo Strauss: The Hidden Dialogue (Chicago: University of Chicago Press, 1995); Carl Schmitt, Leo Strauss und der Begriff des Politischen. Zu einem Dialog unter Abwesenden translated into English by J. Harvey Lomax. _____, Leo Strauss and the Theological-Political Problem (New York: Cambridge University Press, 2006). Das theologisch-politische Problem: Zum Thema von Leo Strauss, translated into English with additional material by Marcus Brainard. –––––, Political Philosophy and the Challenge of Revealed Religion, trans. Robert Berman (Chicago: University of Chicago Press, 2017). Svetozar Y. Minkov, Leo Strauss on Science: Thoughts on the Relation between Natural Science and Political Philosophy (Albany: SUNY Press, 2016). Peter Minowitz, Straussophobia: Defending Leo Strauss and Straussians Against Shadia Drury and Other Accusers (Lanham, MD: Lexington Books, 2009). Thomas L. Pangle, Leo Strauss: An Introduction to His Thought and Intellectual Legacy (Baltimore: Johns Hopkins University Press, 2006). Corine Pelluchon, Leo Strauss and the Crisis of Rationalism: Another Reason, Another Enlightenment, trans. Robert Howse) (Albany: SUNY Press, 2014). Eugene R. Sheppard, Leo Strauss and the Politics of Exile: The Making of a Political Philosopher (Lebanon, NH: University Press of New England, 2006). Steven Smith, Reading Leo Strauss: Politics, Philosophy, Judaism (Chicago: University of Chicago Press: 2006). _____, ed. Cambridge Companion to Leo Strauss (New York: Cambridge University Press, 2009). Daniel Tanguay, Leo Strauss: An Intellectual Biography (New Haven: Yale University Press, 2007); Leo Strauss: Une biographie intellectuelle translated into English by Christopher Nadon. Ayeh Tepper, Progressive Minds, Conservative Poiltics: Leo Strauss's Later Writings on Maimonides (Albany, NY: SUNY Press, 2013). Richard Velkley, Heidegger, Strauss, and the Premises of Philosophy: On Original Forgetting (Chicago: University of Chicago Press, 2011). Martin D. Yaffee and Richard S. Ruderman, eds., Reorientation: Leo Strauss in the 1930s (New York: Palgrave Macmillan, 2014). Catherine H. Zuckert and Michael P. Zuckert, Leo Strauss and the Problem of Political Philosophy (Chicago: University of Chicago Press, 2014). ______, The Truth about Leo Strauss: Political Philosophy and American Democracy (Chicago: University of Chicago Press, 2006). Carlo Altini, Leo Strauss: linguaggio del potere e linguaggio della filosofia (Bologna: Il Mulino, 2000). _____, La storia della filosofia come filosofia politica: Carl Schmitt e Leo Strauss lettori di Thomas Hobbes (Pisa: ETS, 2004). _____, Introduzione a Leo Strauss (Rome-Bari: Editori Laterza, 2009). 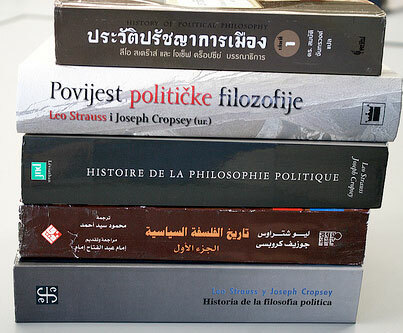 Francois Coppens, David Janssens, and Yuri Yomtov, eds., Leo Strauss: Á quoi sert le philosophie politique? (Paris: Presses Universitaire de France, 2014). Raimondo Cubeddu, Tra le righe: Leo Strauss su Cristianesimo e Liberalismo (Lungro di Consenza: Marco Editore, 2010). Alessandra Fussi, Le cittá nell'anima: Leo Strauss lettore di Platone e Senofonte (Pisa: Edizioni ETS, 2011). Alberto Ghibellini, Al di là della politica: Filosofia e retorica in Leo Strauss (Genova: Genova University Press, 2013). Yoshihiko Ishizaki, Rinrigaku toshite no seijitetsugaku: hitotsu no Reo Shutorausu seijitetsugakuron, Political Philosophy as Ethics: A Discourse on Leo Strauss’s Political Philosophy (Kyoto: Nakanishiya, 2009). David Janssens, Tussen Athene en Jeruzalem: Filosofie, profetie en politiek bij Leo Strauss. Amsterdam: Boom, 2002.Translated into English by David Janssens as Between Athens and Jerusalem: Philosophy, Prophecy and Politics in Leo Strauss’s Early Thought (Albany: State University of New York Press, 2008). Clemens Kaufman, Leo Strauss zur Einführung (Hamburg: Junius, 1997). Terence Marshall, À la Recherche de l’humanité: science, poésie, ou raison pratique dans la philosophie politique de Jean-Jacques Rousseau, Leo Strauss et James Madison (Paris: Presses Universitaires de France, 2009). Heinrich Meier, Carl Schmitt, Leo Strauss und der Begriff des Politischen. Zu einem Dialog unter Abwesenden. Stuttgart: J.B. Metzler, 1988. Translated into English by J. Harvey Lomax as Carl Schmitt and Leo Strauss: The Hidden Dialogue. Chicago: University of Chicago Press, 1995. _____, Das theologisch-politische Problem: Zum Thema von Leo Strauss. Stuttgart: J.B. Metzler, 2003. Translated into English with additional material by Marcus Brainard as Leo Strauss and the Theological-Political Problem. New York: Cambridge University Press, 2006. _____, Politische Philosophie und die Herausforderung der Offenbarungs-religion (Munich: C. H. Beck, 2013). Corine Pelluchon, Leo Strauss: Une autre raison, d’autres Lumières (Paris: J. Vrin, 2005). Translated into English by Robert Howse as Leo Strauss and the Crisis of Rationalism: Another Reason, Another Enlightenment (Albany: State University of New York Press, 2014). Sfez, Gérald, Leo Strauss, Lecteur de Machiavel: La modernité du mal. Paris: Edition Ellipses, 2003. _____, Leo Strauss, foi et raison. Paris: Beauchesne, 2007. Tanguay, Daniel. Leo Strauss: Une biographie intellectuelle. Paris: Editions Grasset & Fasquelle, 2003. 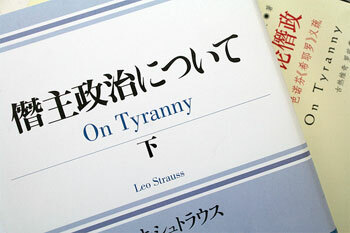 Translated into English by Christopher Nadon as Leo Strauss: An Intellectual Biography. New Haven: Yale University Press, 2007. Archives de Philosophie, Tome 79, cahier 3, juillet-septembre 2016, "Leo Strauss et le probleme politique, Hans Jonas et la question de l'avenier"
Idealistic Studies, v. 44 (2014), nos. 2 & 3, "New Directions in the Thought of Leo Strauss"
Strauss’s work is also increasingly translated and discussed in China, as is noted in an article in the July 28, 2008 edition of The New Yorker. His works have been translated, often with significant critical introductions or essays, into Arabic, Bulgarian, Chinese, Czech, French, German, Hebrew, Hungarian, Italian, Japanese, Korean, Polish, Portuguese, Russian, Serbo-Croatian, and Spanish.